Address: Ave. Texas Esq. Calle 10, Los Jardines, Santiago de los Caballeros (Gran Santo Domingo), Dominican Republic. 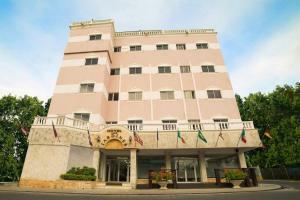 Hotel Los Jardines is located 8 minuites’ drive from Santiago de los Caballeros main square. Free WiFi access is available in all rooms and free parking is offered. Each room here will provide you with cable TV, air conditioning and a refrigerator. The private bathroom also comes with a hairdryer. Extras include a desk and a safety deposit box. Guests can find a variety of restaurants within 500 metres and Plaza Madera shopping centre ois 2.5 km away. Centro Plaza Internacional Market is 5 minutes’ drive away and Cibao International Airport is 10 km away.